The Missoula Interfaith Collaborative, along with other local organizations, individual churches and nonprofits, met Tuesday night to discuss specific solutions to the city’s affordable housing crisis, including a housing trust fund, building density and strategies around barriers to renting. The meeting follows a Voices 4 Housing February housing assembly where the public discussed the many issues Missoulians face in finding affordable housing. A few members of the Missoula City Council and the mayor took an oath at that earlier session to find solutions and implement them as part of the city’s upcoming housing policy. Now, groups are finalizing specific strategies to introduce to the City Council. Three areas of interest include creating a housing trust fund, adjusting zoning and building requirements to increase density, and providing resources to those who face rental barriers. The housing trust fund would pay for things like permanent affordable housing, the preservation and rehab of existing affordable units and assistance for first-time homebuyers. The fund needs to be recurring and specifically designated for affordable housing. One way that the fund could be supported is through a bond issue, but Kaia Peterson, assistant director of NeighborWorks Montana and a member of the Missoula Housing Coalition, said that a bond could work against what a trust fund was created to achieve. If the city were to levy a bond, Peterson explained, protections would need to be in place for people whose housing stability might be threatened by the higher property taxes necessitated by the bond itself. Other forms of funding include a local option or resort tax, gas tax, private investments, or a required percentage of tax increment funding, or TIF. In addition, commercial linkage fees charge developers of commercial developments a fee that can be used for affordable housing. “We’re not going to advocate for a bond as the core funding source or the only funding source. We would need diverse funding sources that aren’t immediately tied to housing affordability,” she said. 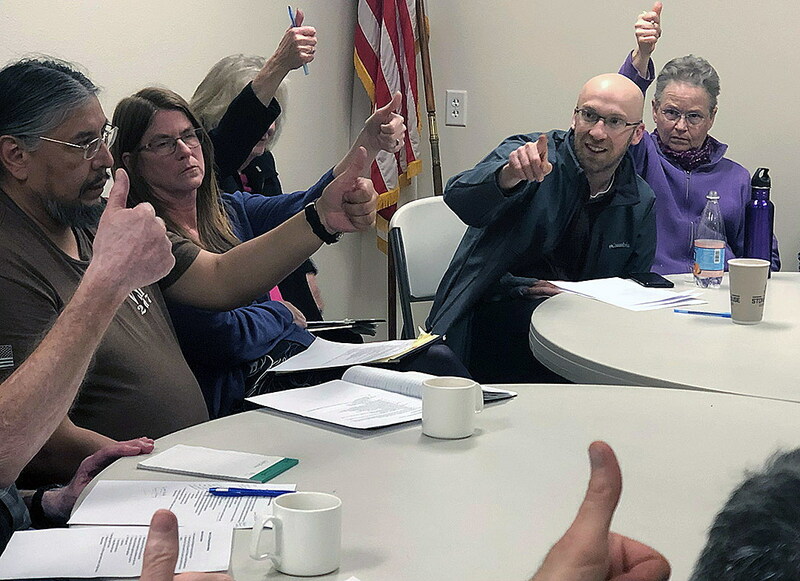 The group talked about adding a time-sensitive residency requirement and allowing the trust fund to span outside the city limits, which could require looking into a countywide funding measure. Increasing housing density in Missoula is another potential strategy. Initiating a community conversation about how to increase density while balancing open space, historic preservation and transportation is important to maintaining Missoula’s character, group participants agreed. Eliminating single-family zoning and replacing it with zoning policies that conform across all neighborhoods is another goal, while also ensuring affordability measures when building density increases. Implementing inclusionary zoning, which requires a certain percentage of new housing to be available at affordable rates, is also in the works and should be determined using a feasibility study. “We as a community need to take a serious look at an inclusionary zoning policy and actually initiate a feasibility study on if inclusionary zoning is a right way forward for Missoula and if so, what parameters and incentives would be included in that,” said Casey Dunning, director of MIC. Those who have been previously incarcerated or have poor rental history or credit struggle with housing, having to pay multiple application fees to compete for apartments they won’t get approved for. Having a rent guarantee fund as insurance to landlords and hiring a liaison to coordinate conversations between tenants and renters were two solutions that were widely accepted by group participants, said MIC’s housing advocate program manager Zeke Campfield. Streamlining a single application process, including credit and background checks, would also drive down costs when applying for housing. Starting a “Gold Star Landlords” list is also a possibility. “How do we get the landlords to do it? We can’t force them to comply and we don’t want to necessarily shame those who don’t comply. But providing a ‘Gold Star Landlord’ list, we’d be publicly lifting up those landlords which acknowledge the rent guarantee fund, the landlord liaison and accept the uniform background-credit check that comes from a centralized form,” Campfield said. The second Voices 4 Housing assembly will take place May 2 after the city’s housing policy is published. These strategies will be introduced to the city and county for further discussion and improvements. Missoula County Commissioner Josh Slotnick and City Councilwoman Gwen Jones attended Tuesday night’s event, and were impressed with the amount of civic involvement. Slotnick said the commissioners will address housing, but isn’t sure what that looks like yet. “There’s a time of year where we set budgets and we look at work plans for our departments, and we’re going to figure out how to fold affordable housing into those things,” Slotnick said. Slotnick said funding these solutions to housing is the biggest obstacle. Passing bonds on Missoula amenities, such as the Missoula Public Library and the new park at Fort Missoula, make the city a great place to live. However, demand for housing and increased property taxes drive up housing costs. Groups like the Missoula Interfaith Collaborative and others that meet to formulate these strategies add to the conversation, which results in a better understanding of what Missoula needs, Jones said.